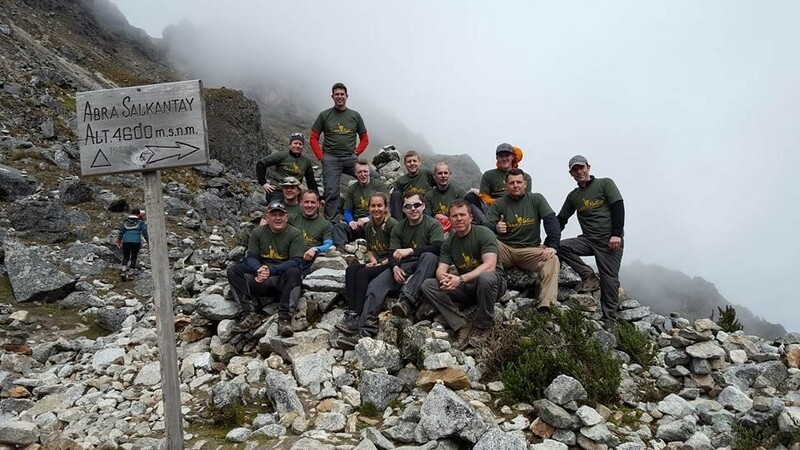 26th March 2017, 14 regular and reserve personnel from 104Bn REME embarked on an expedition to Machu Picchu in Peru. The following 14 days were an odyssey of lost boarding cards, inexplicable bag searches, contraband tent pegs, a naked man in the airport and mountains. Lots of mountains. The journey to Peru began in Northampton, with a ferociously early start to drive to Heathrow. From there we boarded a flight to Madrid (after Sgt White managed to locate his boarding pass). We had a couple of hours to kill in Madrid airport while we waited for our connecting flight, where most of the junior ranks decided to sample the local cuisine in Burger King. Finally, we boarded the flight to Lima (after Cfn Skippen and Cfn Morris discovered that Tent pegs are not allowed in your carry-on luggage). Once again, Capt Andy Murray’s organisational skills hadn’t let us down, and there was a minibus waiting for us to take us through the bustling, cramped town to the Hostel that was to be our base for the forthcoming days. Having carried our kit up a seemingly endless stair to the front door, we were ushered in by our charming hosts. The accommodation was rustic, but comfortable and, after a couple of days of acclimatisation treks, we happily overlooked its few flaws. We spent the remainder of the day exploring the city. After conquering the Incas, the Spanish had systematically torn down the temples and Palaces of Cusco, and replaced them with their own cathedrals, churches and courts. As a result the city is a curious mix of 16th Century Spanish town and Inca ruin, beautiful and sad at the same time. 11 long hours later we arrived in Lima, capital and main population centre of Peru. Initial impressions were heat, humidity, noise and chaos. We were whisked away into the anarchy that is Peru’s traffic system by our in country hosts and deposited at our hotel for the night. Weary from the journey we retired (relatively) early and awoke fresh for the day ahead. Returning to Lima airport, we boarded an internal flight to Cusco, capital city of the Incas and main hub for those exploring the Sacred Valley and its Inca ruins. The flight was short, but provided us with our first view of the terrain we’d be spending the days ahead trekking through. Peru’s interior is a stunning vista of mountains, valleys and rainforest, as the aircraft banked through the sacred valley to land at Cusco airport, the scale of the task ahead soon became apparent. The following morning, we began our acclimatisation. With only 3 days in the programme, we had to hit the ground running and did just that. Beginning with Sacsayhuaman, a large temple complex on the edge of Cusco, and moving on to 3 other, smaller, sites along the edge of the valley we ended the first day with a bus ride back to Cusco and prepped our kit for the following day’s overnight excursion. This was to Huchuy Qosqo, an old Inca town and former Royal Estate of the 8th Inca emperor Viracocha. The campsite was nestled just below the ruins of the old palace, and looked out over stunning views of the Sacred Valley and its surrounding snow tipped peaks. The Incan gods had been kind to us this first day, and the morning began bright and clear, however, as we packed up, the clouds began to form, and our descent into the valley and journey to the town of Lamay was decidedly damp. We arrived at our lunch rendezvous a little early, so ventured into the town to explore. Lamay is famed in Peru for its specialty dish Cuy al palo, or spit roasted guinea Pig, which has a curious taste, not unlike Rabbit. Fully fed on Cuy and chips, we boarded the bus back to Cusco for more local flavour (Alpaca steaks) and prep for the 5 day trek to Machu Picchu. 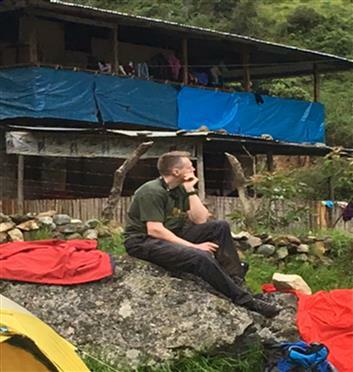 The Trek began with a 5am start and another nerve wracking bus journey to the start, the flooding in Peru had taken its toll on the roads, and there were a number of heart in mouth moments as our skilled local driver gingerly edged his way round landslides. To fully give justice to the next 5 days in this short article would be near impossible. The views, spirit of the group and warmth of the local guides were truly once in a lifetime experiences. 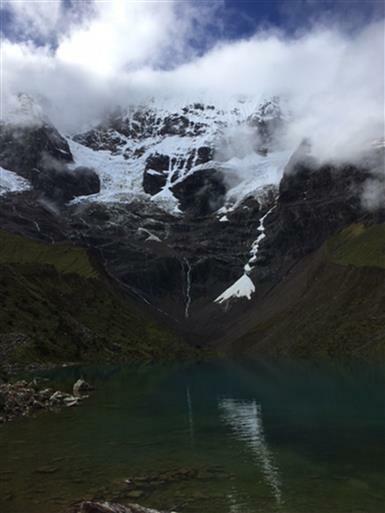 From brilliant blue lagoons, framed by towering snow-capped mountains, to the epic Salkantay pass, some 4600 metres above sea level, to the fringes of the Amazon rain forest, we passed through a landscape that was other worldly in its magnificence. An overnight stay (and much needed shower) in the town of Aquas Calientes preceded the icing on the cake, the ruins of Machu Picchu, last stronghold of the Incas. After a short bus journey up tortuous switchbacks, we arrived at the entrance. Our guide took us on a brief tour of the site, before we parted company and were left to explore on our own. Machu Picchu was abandoned by the Incas towards the end of the 16th Century, and so was never discovered (and therefore never destroyed) by the Spanish. Perched atop a mountain overlooking the valley it is truly awe inspiring. 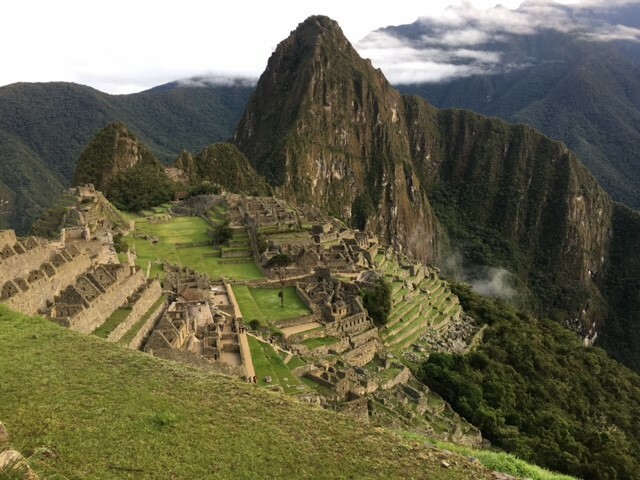 Next to Machu Picchu mountain is its big brother, Huayana Picchu. This is open to the adventurous to climb, which, of course, we duly did. It is at this point that I have to admit to being slightly concerned by heights, and as I scaled the worryingly named “stairs of death” had one of those moments where you begin to question your life choices. Pulling myself together, I made it to the top and was rewarded by a view that will remain with me for the rest of my life. All too soon our time was up, and we had to return to the Railway Station to begin our return journey, and after a brief 3 hour delay while Peru’s answer to Network Rail cleared a large rockslide, we headed back for one last night in Cusco. Whilst the group celebrated Cfn Chisholm’s birthday, one member of the team had to remain behind, having caught a dose of Inca belly and dare not stray too far from the ‘facilities’. The following day saw us back in Lima and another birthday celebration, Lt Col Smith was the birthday boy this time. With some sore heads and heavy hearts we had our last day in Peru. The flight to Spain wasn’t until the evening, so the day was ours to sample big city life Peru style. After a morning’s surfing and an afternoon sleeping off excessive lunches, we boarded yet another aircraft and began the long journey home. Peru is a beautiful country of massive contrasts, from lofty snow-capped mountains, to sweltering, humid jungle and arid desert, from subsistence farming to wealthy city folk driving brand new Mercedes. The trek itself was demanding, and forced several of us way outside our comfort zones, but, thanks to a remarkable team spirit, we all came through with a massive sense of accomplishment, not to mention a desire to push beyond the Summer mountain foundation course and onto mountain leader courses. Finally, on behalf of the whole team, a big thank you to Capt Murray whose organisation of the trip was superb and as exercise i/c must have felt it was like herding cats at times. We would also like to give a big thanks to the Ulysses Trust whose financial assistance helped make the expedition possible. 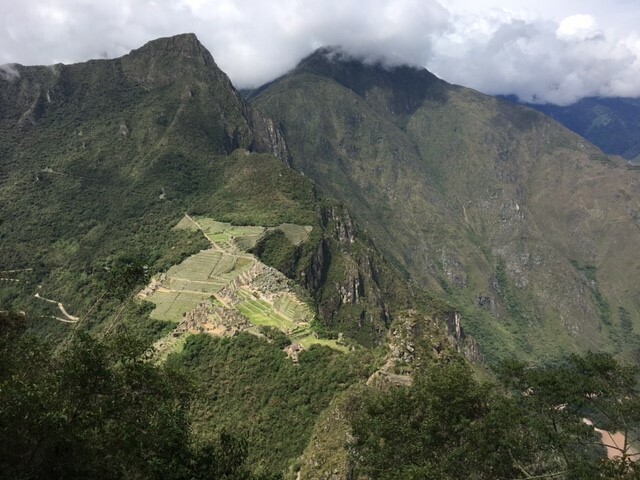 The view from Huayna Picchu.